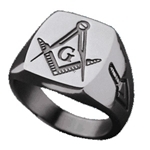 Masonic Ring 12mm Tungsten Multi-facet Signet style ring with symbols. 12mm Tungsten Carbide Multi-facet Signet style ring. 2mm thickness. The finish is highly resistant to scratches and scuffs, holding its mirror-like shine for years. 3 Engraved Masonic symbols on front of band. Be sure of your size. You may print our ring sizer. Please be aware of the knuckle. I ordered two of the Masonic tungsten rings and appreciated the value and the service! I received my ring today and I am very impressed with this ring. For the brother who's looking for a ring that's simple but yet classy this is the ring to buy. I defiantly recommend this ring to all those brothers out there. This ring is a Excellent choice for everyday wear.High shine,scratch free and a great price. I am very happy with this ring.